But the bottom line is VERY few people implement any safety features. I’ll take a stock ms41 ecu over a generic standalone install every day. Anyway, glad the car is running! Granted, I haven't ran the car since or had it on the lift yet. Finished reading this goldmine of a thread, it's really evident how knowledgable and helpful people in the community can be and it's fantastic. The information in this thread is pretty unreal, thank you for all of the conversation and documentation. Is your wastegate reference pre or post intercooler? Miata guys had a time where they figured out post intercooler was the better reference. Lol, 'goldmine,' I don't know. I asked a lot of funny questions... It was and still is a learning process. Anyone have any rear calipers they'd be willing to part with? FWIW, wastegate reference lines should be boost reference only (non vacuum sources). The intercooler acts like a damper, and since it’s the largest source of pressure drop ,measuring from the “cold” side is pretty much the optimum location. for sale rear brake calipers? Last edited by 328iFun; 03-16-2019 at 06:36 PM. I have my wastegate reference at the manifold, ideally, on the compressor housing is correct. Although, I've never EVER had any problems off the manifold with my gate. From literally 3 psi all the way to 20 psi with no controller or anything. I count it as a goldmine cause of all of the questions you asked and even more so all of the knowledge that butters left. Vollosso is on track with the Miata guys, they were measuring a pressure difference of a few psi pre and post intercooler. With the turbo setups they were using, they would spring for 15psi and with a pre intercooler reference they would see boost drop at high rpm and airflow. In my head*, a manifold reference wouldn't be good since the throttle plate would be a restriction that the turbo would spin like crazy to get the boost at reference that the WG is looking for. *I have not read maximum boost so please take this with salt as it is a guess. Any updates as we start spring and the season? Good, I'm glad you found some useful information. 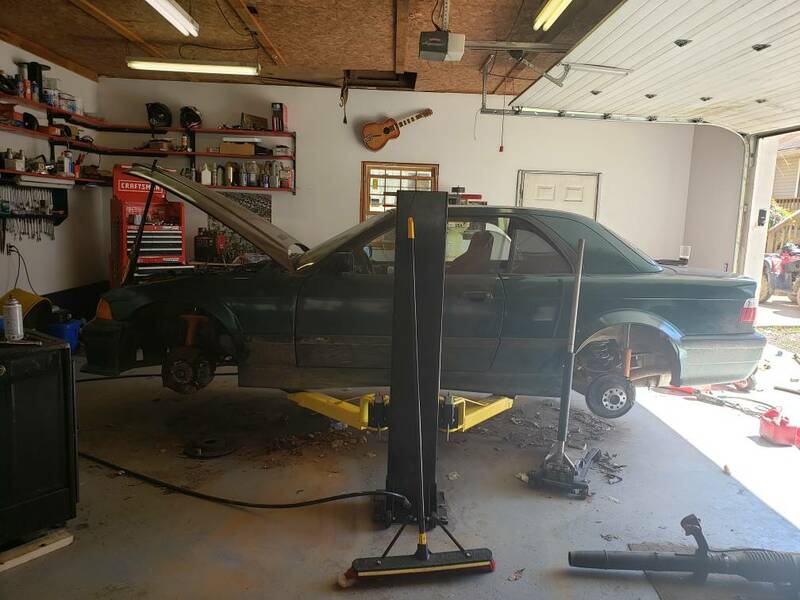 Right now the car is in my garage on the lift. I had a rear brake caliper blow out on me. I ordered replacement calipers from a member on here, just waiting for them to arrive. Aside from that I've just been working on cleaning the car up a little bit. Painted the fenders flares, installed camber arms, catch can, and am looking for aero stuff (rear/side skirt diffusers, front bumper splitters) to make the car look better. 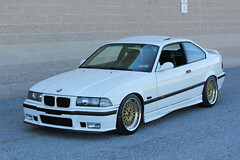 Eventually some cheap GM pattern wheels for wider tires in the rear and then rear bushing or swapping in an M3 setup. And yes Butters, even though I haven't seen him around here in forever, is a great a person. And really, the only item I gathered from Maximum Boost (most of the knowledge I obtained was from here and just reading around) was to have a flex pipe after the turbo. That explanation of exhaust gas and the expansion of material is a pretty good read. Last edited by 328iFun; 03-23-2019 at 01:13 PM. What is that lift ????? I’m envious. Whenever people would mention getting a lift for their garage, I never knew it was that small! That must be nice. What's the highest you've gotten it up to? Can you stand under it? Yeah these are nice for a low ceiling garage. I still love my full size 2 post. I'm almost 6 ft. And can walk underneath with hitting anything but the tires. If I had a personal garage i'd totally use this. 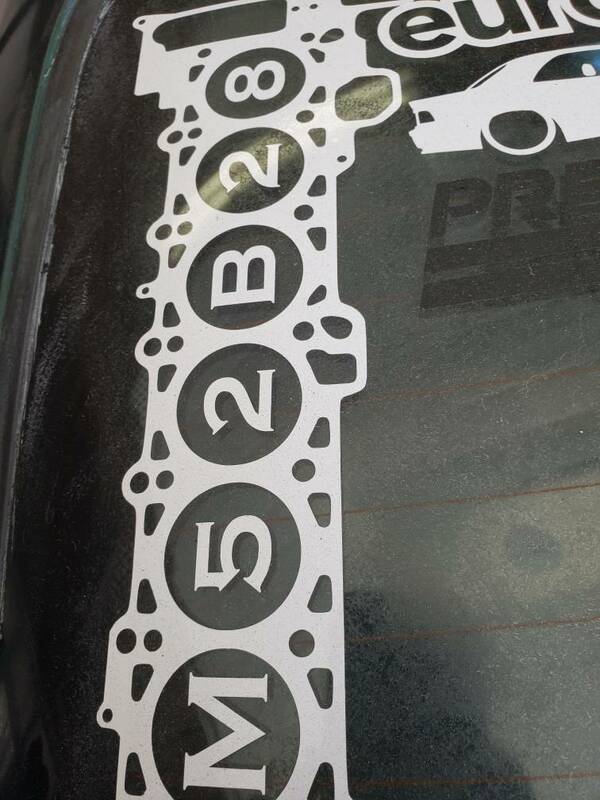 What are the benfits of running an m3 rear vs 328? How noticeable would they really be? There should be a noticeable difference in the amount of times you get stranded from broken stub axles. M3 gets you a shorter ratio and limited slip and heavier duty rear axles and bigger rear brakes (though your convertible has bigger rear brakes than a regular 328). 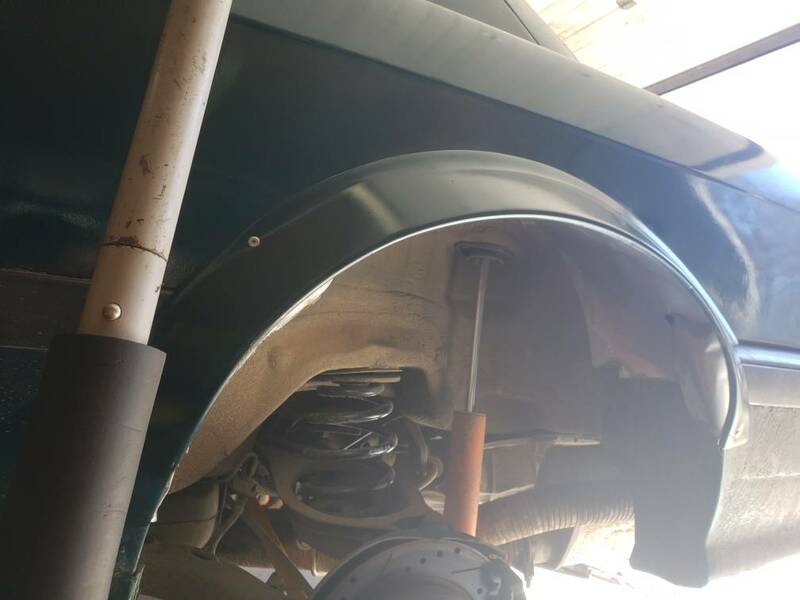 Make sure you get the axles and trailing arms and brakes with the rear since it all goes together. As for breaking diff output stubs, I broke M3 ones with drag radials when launching at the strip with 500+ lbs rwtq. They are bigger than 328 ones, but I am not sure about the splined part in the diff — I was breaking that splined part and am not sure the M3 splined section is bigger than the 328 splined section. This is probably only an R compound tire at the strip issue. There will be a noticeable difference. I have broke three axles on my 328. 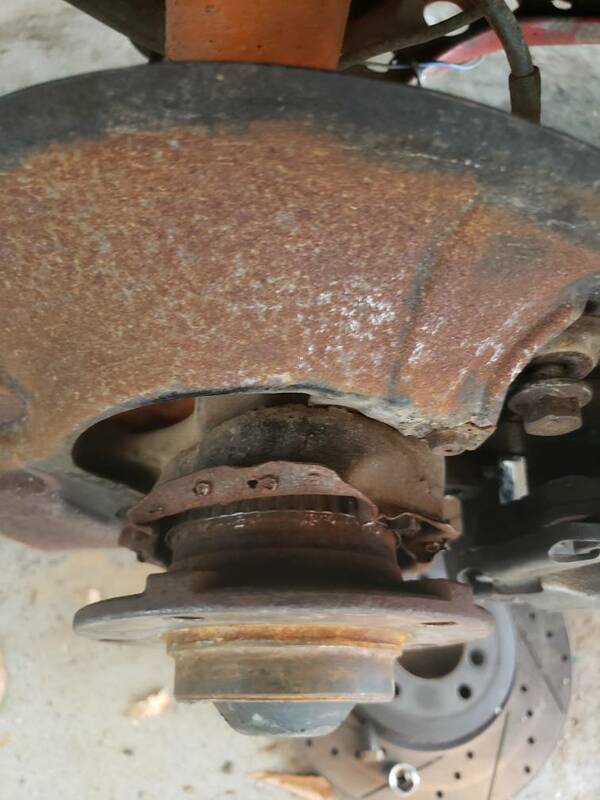 You can get replacement axles from O'reillys with lifetime warranty but it becomes a pita to fix. After breaking the third I get a whining noise from the diff during shifts. An m3 rear end will be the move in the near future.